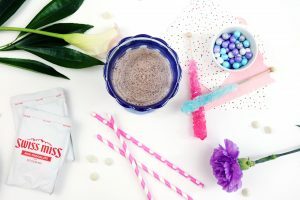 Unicorns are all the rage lately and when I came up with this ‘Cool’erful Unicorn Frozen Cocoa drink for my daughter, I knew it’d be her most requested drink this summer. 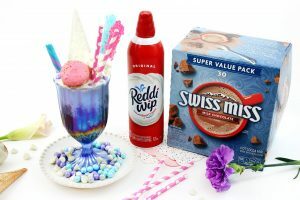 This frozen hot cocoa is made with Swiss Miss® Milk Chocolate Hot Cocoa Mix and a dollop of Reddi-wip® Original Whipped Topping (both can be found at Walmart). 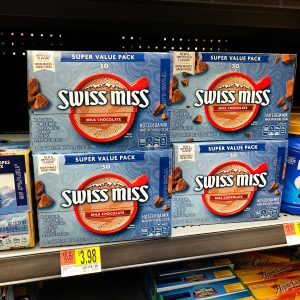 I love that Swiss Miss® is made with real milk! 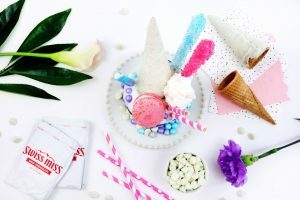 This frozen cocoa has a confetti white chocolate dipped mini ice cream cone, a layer of vanilla milkshake along with colorful candies and sprinkles… even a delicious macaroon! It’s sure to hit your sweet spot! For more than 50 years, Swiss Miss® has been creating their signature blend in real dairy in Menomonie, Wisconsin. They support more than 80 local dairy farms that supply them with farm-fresh milk every day, and they package all of our products here in the USA. 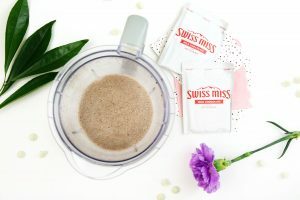 I always keep a box of Swiss Miss® Milk Chocolate Hot Cocoa Mix around our house even in the warm months. 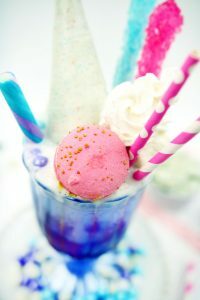 It can easily be made up into a frozen treat, such as this ‘Cool’erful Unicorn Frozen Cocoa. It’s wonderful that this product is made from real milk. 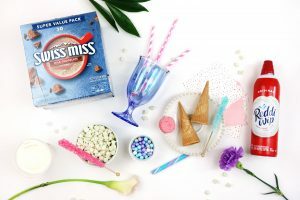 I went to my local Walmart store and easily found a box of the Swiss Miss® Milk Chocolate Hot Cocoa Mix. 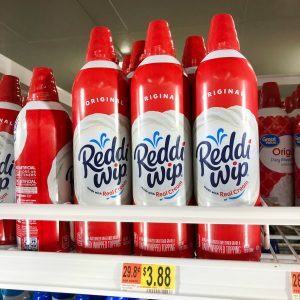 I also found the Reddi-wip® Original Whipped Topping at Walmart, which is a perfect topper for frozen cocoa. You can purchase any other candies or sprinkles that you want to add to your frozen cocoa at Walmart. Candies, such as rock candy sticks, sprinkles, etc. Dump the bag of confetti white chocolate chips into a medium sauce pan and add a tablespoon of oil to the mixture (so it doesn’t dry out). Cool on low to medium heat until the chocolate has melted. 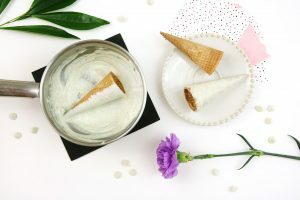 Keep it on a warm burner and dip the ice cream cones into the melted mixture until covered. Set them on a plate to allow the white chocolate to dry. While you wait for the chocolate to dry on the ice cream cones, prepare your frozen cocoa mixture. You’ll combine the cocoa mix and hot water in a small bowl. Place cocoa mixture, milk and ice in blender and blend until combined. Keep in refrigerator until ready to serve. Now you’ll pour the frozen cocoa mixture into the mugs until they’re halfway full. Top the mug with the vanilla milkshake. 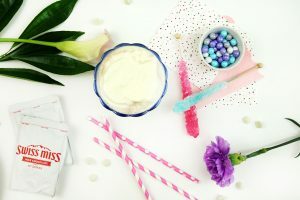 Top the drink with all of your candies, a macaroon, fun straws and don’t forget a dollop of the Reddi-wip® Original Whipped Topping. 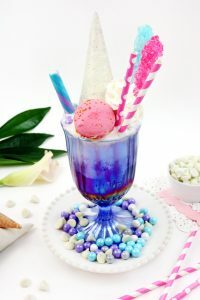 I love serving the drink on a small plate with additional candies and chocolate chips on the bottom for a little more color. Find more frozen drink inspiration HERE.